This is just one of those documentaries that I feel would stand a better chance if it was primarily marketed toward the education departments of schools, although having viewed the disc in it's entirety that is a real shame as it is a great experience all the way through. These are the stories about some of the most influential families in the country and what has been the driving force behind them. It's amazing, especially in the case of the Murdochs, how they dominated the world of media and have successfully groomed successive generations to take over the reins of the business in order to make sure that the family retains control of the empire. 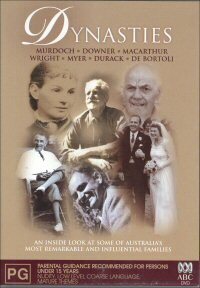 Another that interested me (the whole disc did, but there were two standouts for me) was the background of the Downer family (currently headed by Liberal MP Alexander Downer) and how they have been a part of the Australian scene for years and years. Every single segment on this 2 disc set has been put together with amazing attention to detail and edited in a fashion that you never lose interest. Other families covered in this series are. the Macarthurs, Wrights, Myers, Duracks and De Bortolis. Each story is told with a degree of respect to those concerned, however to the interviewees credit, does not shy away from anything that might be considered to be a bit riske. The footage and audio varies on this disc depending on where the said footage was taken from. Some is simply archive footage from family libraries, others is taken from television, overall it all sounds and looks good. This series is an amazing chance for the common man to have a look at what the movers and shakers in our country have done over the years and what they brought to Australia as a result. There are no extras on this DVD. Recommended.